Constructed: 70 – 80 A.D. The Colosseum is an elliptical amphitheatre situated in the centre of the city of Rome, Italy, the largest ever built in the Roman Empire. 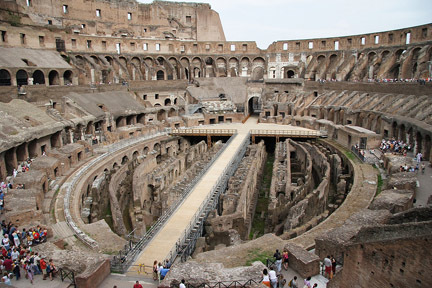 The Colosseum is situated next another of Ancient Rome's greatest sites; the Roman Forum. How to get to Colosseum? The Colosseo district is the heart of ancient Rome where the Colosseum, the Forum, and the Capitoline Museum are located. 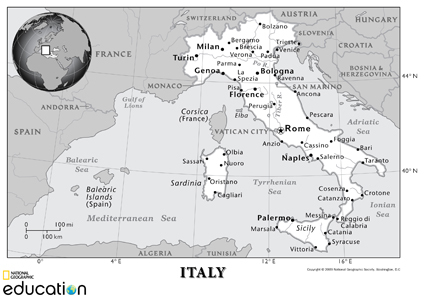 Rome has two main international airports. Leonardo da Vinci/Fiumicino International Airport is Rome's main airport. It is modern, large, rather efficient, and well connected to the center of the city by public transportation. Ciampino International Airport is Located to the southeast of the capital. It is the city's low-cost airline airport. The Roman Colosseum is located extremely central in the city of Rome can be visited using public transport by the metro, bus or by tram. Overlooking Bernini’s Triton Fountain, the Barocco is a boutique hotel with just 41 rooms, located in an old aristocratic building in the heart of Baroque Rome. Carefully refurbished in 2010 to offer guests superior standards of comfort and style, the Barocco has followed the example of leading international hotels, becoming 100% smoke-free. Attention to detail, absolute cleanliness, unique and highly sought-after rooms, an atmosphere from times past, and 21st-century technology, make guests’ stay at the Barocco a warm Italian experience full of magic. The Artemide Hotel is situated in the heart of Rome, 900 meters from the Termini railway station, in the shopping area of Via Nazionale. This lively, upscale Rome street that brims with fashion stores, stylish cafes and typical restaurants was created in the 1870s to represent the main street of the Capital of Italy. Via Nazionale links Rome’s central Railway Station (Stazione Termini) with the heart of downtown Rome and allows you to easily reach, within a 10 minute magnificent walk, the Coliseum, Roman Forum, Pantheon, the Spanish steps and all the major city attractions. You can also visit Vatican City (located in a different section of Rome) in only 15-20 minutes. The bus and metro stop near the hotel are particularly useful for all your personalized itineraries in Rome. Hotel Diocleziano commands a privileged central location in Rome yet it is absolutely quiet: at 300 meters from Termini station and 3 minutes from Piazza della Repubblica; just to get an idea about the location, from the hotel you can see the Terme di Diocleziano and the cloister of the church of Santa Maria degli Angeli. Among the 4 star hotels in Rome around the Termini station area, Hotel Diocleziano is truly privileged in that it is located away from the bustle of the center and still near some of the most beautiful monuments and museums of Rome, besides being at 100 meters from the bus stop, the tramway and subway that lead to all the most important places in the city (Saint Peter's, Piazza Navona, the Coliseum, etc.). Have you already visited Colosseum or plan on visiting? Do you have an interesting Colosseum travel story? We would love to hear about your Colosseum travel experiences, your reviews of hotels, restaurants, or tours, your top travel tips and any recommendations...anything about the Colosseum travel that you can share with us.